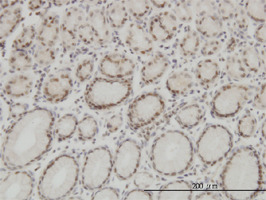 Staining of paraffin embedded human stomach with preservative free Mouse anti Human high mobility group protein B1 (MCA4045Z). Mouse anti Human High Mobility Group Protein B1 antibody, clone 1E6-E10 recognizes human high mobility group protein B1 (HMGB1). HMGB1 belongs to a family of proteins involved in chromatin organisation and DNA structuring. During inflammation HMGB1 is actively secreted by macrophages and functions as a cytokine. Recombinant protein with a GST tag corresponding to amino acids 1 - 216 of human HMGB1. 1This product requires fixation of cells for 15 minutes. 4 % paraformaldehyde solution (NaOH in PBS) pH 7.4 is recommended for this purpose.